Ko olina is where every day is most people's dream vacation. Glamorous hotels, secluded beaches, championship golf, restaurants, boat harbor, shopping and events. 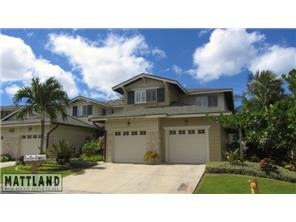 Ko olina golf estates is a gated community surrounded fairways. This home faces the trade winds and has views of the resort and disney aulani hotel. Upgrades exceeding 50k include: crown molding, mahogany cabinets, granite counters, stainless appliances, mandalay fans, wired for surround sound, plantation shutters and upgraded flooring. Association includes access to beach & sports club, fitness center and organized activities.